This chemistry dictionary offers the chemistry definitions starting with the letter Y. These glossary terms are commonly used in chemistry and chemical engineering. Click the letter below to find the terms and definitions beginning with that letter. yield – In chemistry, yield refers to the quantity of a product obtained from a chemical reaction. 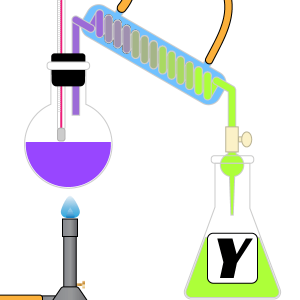 Chemists refer to experimental yield, actual yield, theoretical yield, and percent yield to differentiate between calculated yield values and those actually obtained from a reaction. yield strength – Yield strength is the stress required to produce a very slight yet specified amount of plastic strain. yellowcake – Yellowcake is uranium(IV) oxide (UO2). Yellowcake is produced during an intermediate step in the production of uranium hexafluoride obtained from leach solutions during uranium ore processing. The material is called yellowcake because a drum of the powder produced by early uranium mining operations resembled a yellow cake. yild or ylide – A ylide (pronounced ill-id) is a neutrally polar molecule formed by bonding a negatively charged atom to a positively charged heteroatom where both atoms have a full octet of electrons. The negatively charged atom in ylides is typically a carbanion atom and the heteroatom is often nitrogen, sulfur or phosphorus. Methylene(triphenyl)phosphorane is an example of a ylide molecule. yocto – Yocto is the prefix associated with x10-24 and is denoted by the symbol y.
yotta – Yotta is the prefix associated with x1024 and is denoted by the symbol Y.
ytterbium – Ytterbium is element number 70 with an element symbol Yb. yttrium – Yttrium is an element with an atomic number of 39 and atomic weight of 88.90585. It is a dark gray metal that is used to make alloys for nuclear technology because the element has a high neutron transparency.